Function Tester, Ground (Pass 0.025, Fail 0.1mA) Leakage (Pass 220k Fail 120kohm) Arcover 750V ± 400V. The HTT-1R provides a fast, safe and reliable way to verify proper operation of Dielectric Withstand (hipot) and Ground Continuity/Ground Bond Testers between calibration cycles, in accordance with requirements of TUV and other European agencies. It uses actual loads to simulate barely passing and barely failing results to exercise the tester(s), and is designed to be used as a verification test fixture in compliance with the requirements for shift by shift verification stated in ECS CIG-023 Inspection Report, Section 4. See the Manuals Section below for an example of the CIG-023 Inspection Report. It allows the operator to check the result of the three failure modes encountered in production hipot and ground circuit testing (open ground, high leakage current, and dielectric breakdown) separately or in any combination to verify proper test equipment operation. A passing test is also simulated. 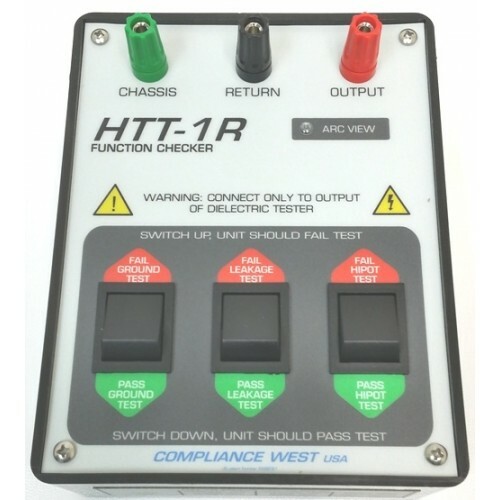 The test leads allows connection of the HTT-1 to any hipot tester using a standard NEMA 15A receptacle, or use the leads on the hipot and ground tester to connect directly to the HTT-1R. The manual contains anticipated results and suggests testing procedures. 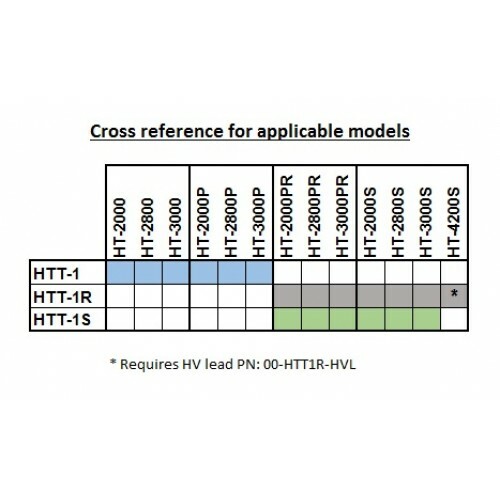 The maximum voltage the HTT-1 can test is 3000Vac/4200Vdc. 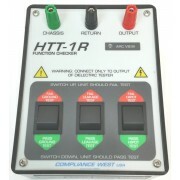 The HTT-1R Family has ranges suitable for many scenarios, and a Custom solution. HTT-1R ExmA, Function Checker, Ground Pass (0.025 Fail, 0.1Ω) Leakage (Pass 220k Fail 120kohm) Arcover 750V ± 400V. Dielectric Withstand Failure (Arc View window displays an arc at 750Vac ± 400V). Arc Testing is at 750 ± 400Vac. Results visible through Front Panel Window. The HTT-1 is a passive device. No batteries or power is required. Verifies proper operation of your equipment in less than a minute. For testing of Ground Bond Testers up to 30A..
For Specifications, see Datasheet Link, above. For more Specifications, see Datasheet Link, above.